If you’ve ever seen a bat in flight, you know how impressive their aerial acrobatics can be — so impressive that we have yet to successfully imitate it the way we have with quadrupedal locomotion or bird flight. This impressive new flying robot is the best attempt yet, though it’s still a long way from the “unrivaled agility” of the real thing. Soft robots that flap rather than use rotors could be safer, cheaper and more agile than traditional drones, or at least that’s what the researchers think. The creatively named “Bat Bot” comes from roboticists at the California Institute of Technology and the University of Illinois at Urbana-Champaign. It’s not the first to imitate bat biology in pursuit of aerodynamism, but a number of new techniques put it at the head of the pack, or rather colony. One advance is the skeletal structure of the robot’s wings. Bats have 40 joints in their wings, allowing for an extraordinary amount of control over everything from angle to the wing membrane’s rigidity. “Arguably, bats have the most sophisticated powered flight mechanism among animals,” the paper reads in its introduction. However, attempting to replicate this complexity is doomed to failure, as even the best joints and actuators we have are nowhere near as powerful or lightweight as bats’ natural ones. “This school of thought can lead to the design and development of robots with many degrees of actuation that simply cannot fly,” the paper continues. On the other hand, eliminate too many of the joints and the resulting flight style is nothing like the fluid, elegant motion of the bat. The team took a middle road, identifying only the most important joints and motions, allowing them to imitate bat-like maneuvers while keeping the mass under 100 grams. Another thing that sets bats apart is the fact that the material making up their wings is highly deformable, and they use that to their advantage. Any artificial wing that doesn’t stretch and billow like the bat’s membrane is missing out on a key characteristic of its flight style. So the researchers made their own silicone-based imitation bat skin only 56 microns thick — about half the width of a human hair. Between these and a lot of hard work studying the minute movements that go into every little bat flight pattern, the team was able to recreate three motions: straight flight, a banking turn and a swooping strike (it struck the safety net, anyway). With its wings flapping up to 10 times per second, the bat flew at 12 MPH and dove at over 30 MPH. It can’t hover, but Chung suggested that hovering isn’t really necessary if the robot knows how to perch or cling. 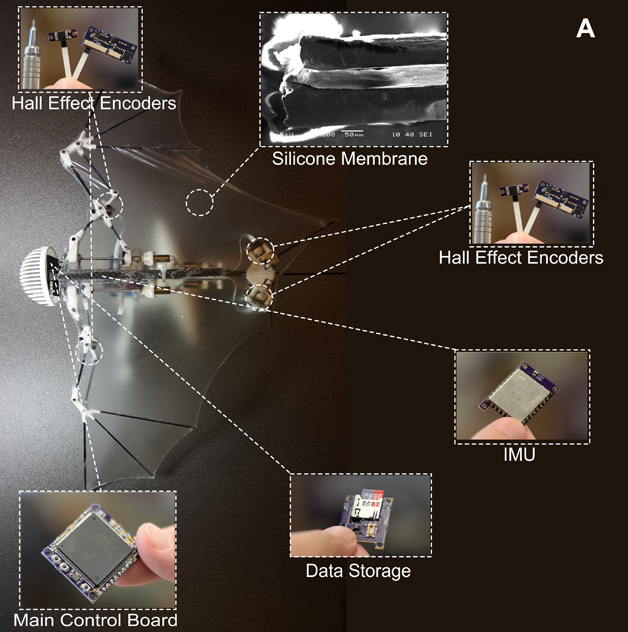 The researchers envision bat-like bots, lightweight and agile, performing duties around humans, where heavier drones with high-speed rotors might not be welcome: hospitals, construction sites, homes. That’s a long way off, of course, but the advances are welcome in and of themselves; they also contribute to our understanding of bat flight. Perhaps we’ll soon even have a “Spy in the Wild” type bot that will give us a bat’s-eye-view of colony life and bug hunting. The team published their results today in the recently launched journal Science Robotics.